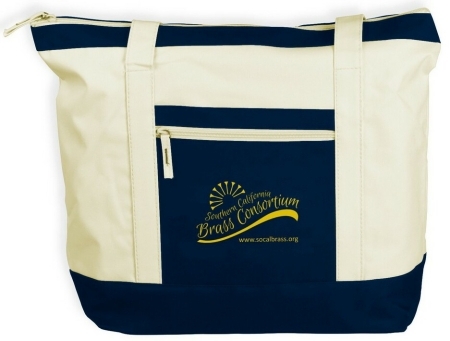 will receive a large canvas tote! SCBC gratefully acknowledges the individuals, sponsors, donors and volunteers that contribute to our success. It is because of the generous support of our patrons that SCBC continues to develop into one of Southern California's major performing ensembles. As with any performing organization, ticket sales only cover a percentage of our operating expenses. Your contributions, in any amount, help make up this deficit, allowing us to produce high-quality concerts and recordings, develop effective marketing, and assist us in developing an educational outreach program to introduce brass music into our local schools. All individuals, groups and organizations who make a contribution will be listed on our website. Names of donors who donate $100 or more (Bronze level) will be listed in our SCBC concert programs. Contributions of $250-$499 receive 1 free ticket and contributions of $500 or more receive 2 free tickets to our regularly scheduled concerts (special events and fundraisers excluded) for our 2018-19 season. 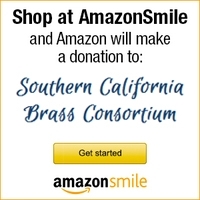 Southern California Brass Consortium is a 501(c)(3) nonprofit organization. All or part of your gift may be tax deductible as a charitable contribution. Please check with your tax advisor.